Just A Car Geek: First Generation Saab 900 Turbo Convertible - A Car For Everyone? First Generation Saab 900 Turbo Convertible - A Car For Everyone? I have a whole new window on the world. Literally. I moved my business to a new town and the front of the building has brand new, crystal clear windows. There is a rough BMW 325ix always parked across the street. I found the owner of it sitting in a bar the other night. He doesn't want to sell it, he's restoring it. He gave me a "tour" of the car and, if he does what he says he's going to do, it will be a very nice car by this time next year. An Audi A5 pulled up right in front of my window. It was driven by a person who looked remarkably like an older version of a friend of mine. A5s are really nice looking cars. There's a new, white, Maserati Quattroporte that drives by each evening around 5PM. I love Maseratis, but I'm not crazy about the styling of the 4 door. There is an orange MGB that drives around town all day long. I've twice seen a very nice TR6 and a Jaguar XJS. Nice, interesting, cars drive by all day (along with many, many common cars). Eventually I'll get used to seeing all these cars, but for now it's like having a little car show outside my window. 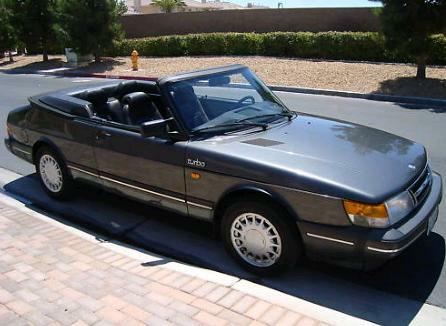 A Saab 900 convertible, just like this one, pulled up and parked outside my window this afternoon. It sat there, top down, for a few hours. I've always liked the older Saab 900 convertibles. The 900 line was first introduced in 1978. Saab managed to sell it and keep it fresh until 1993. In 1994 the Saab introduced the new 900, which was based on an Opel platform. It was a nice enough car, but nowhere near as unique as the original. It was also nowhere near as reliable. The 900 convertible was as well engineered as the 900 sedan. The power top was insulated and took a very short time to raise or lower. Saab added a spoiler between the top and trunk which both hid the top and gave the car a cleaner, more aggressive look. 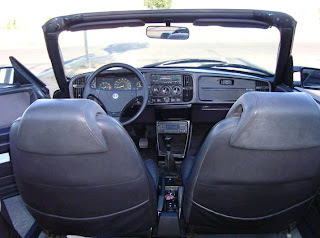 The interior was typical Saab 900, with all the usual Saab 900 features and quirks. This is a 1989 Saab 900 Turbo convertible. The turbo version was a quick car in its day, with 60 MPH coming in around 9 seconds. 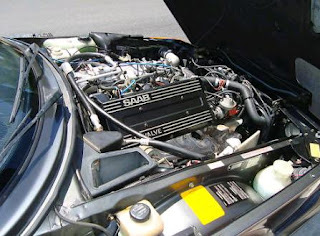 The 2.0 liter engine, although updated and redesigned over the years, can trace its roots back to the 1972 Saab version of the Triumph slant 4 (the TR7 / Dolomite engine). As the seller of this one notes in his ad, if the oil is changed regularly and some attention is paid to the cooling system, these engines with last well over 200K miles. This car is a well maintained 2 owner car. It comes with its original invoice and complete service history. The car has spent at least part of its life in Nevada and is rust free. The Saab 900 convertible is close to being a perfect car. What I mean by that is it appeals to a broad range of people. You see them driven by men and women. Car geeks love the 900's abilities and engineering. Non-car geeks appreciate its safety and reliability. Everyone appreciates that it's a sporty convertible that comfortably seats 4. That doesn't mean that everyone wants to own one; if you want 4 doors, a big V8, or something like that, the Saab isn't for you, but you rarely hear anyone say a bad thing about them. Located in Las Vegas, NV, click here to see the eBay listing.